I haven’t reviewed a book for a long time so when I got an offer to review Ajay Jain’s book I jumped at the opportunity. Which self respecting travel Junkie would say to no to reviewing a travelogue ! Well not exactly a travelogue. 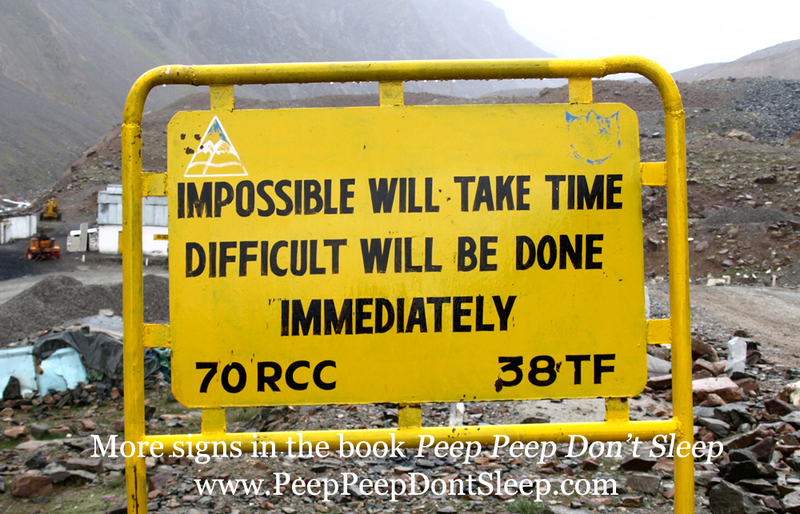 You can’t really call "Peep Peep Don’t Sleep" a travelogue per se. 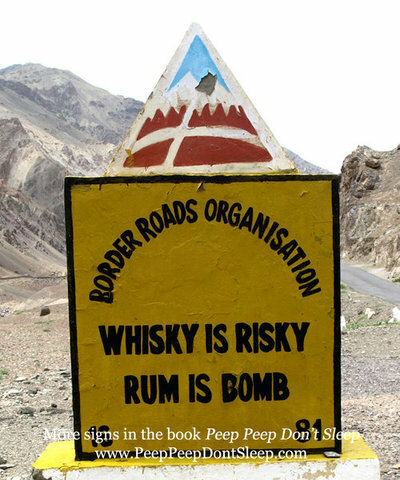 It’s a very interesting book by Ajay Jain that is basically a compilation of amusing road signs that Ajay clicked during his travels. 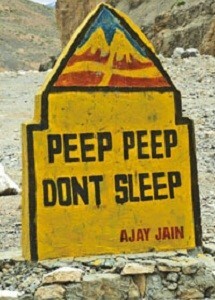 As most of us know, Ajay Jain is a full time writer, professional blogger and photographer. He is also founder of the fabulous travel café Kunzum. 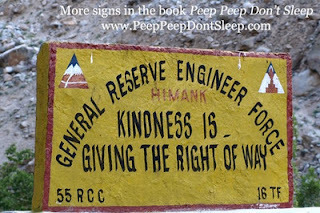 Ajay travelled by road for over 10,000 kms, mostly in the mountains and most of the road signs he clicked and compiled into this book have been put up by the BRO(Border Roads Organization). While travelling through the mountains, the journey is never boring because the scenic beauty around us is always enthralling be it the rugged mountains of Ladakh or the lush greenery of Himachal. 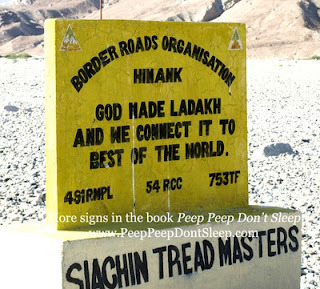 But what make the journey even more interesting are the road signs by BRO. You cant really miss the road signs put up by them if you have travelled in areas adjoining the Pakistan, China or Nepal border. I can vouch for the fact that the BRO road signs are a sight worth looking out for ! The BRO men don’t believe in putting up just simple boring road signs. 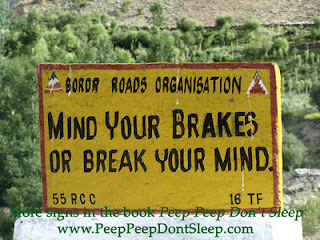 Instead their road signs are witty and quirky. 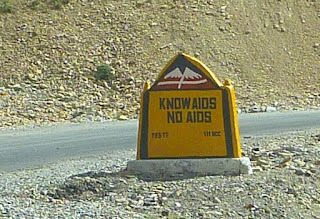 I like to think that the BRO men are a creative lot who are stuck high in the mountains and the only way they get to unleash their creativity is through the road signs they put up.Their road signs combine humour, caution, wisdom and philosophy all in to one ! Ajay’s collection is vast and fascinating.Here are a few samples from the book. 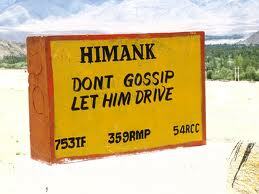 The BRO also tries to be witty with signs such as [Go Slow on my curves] and [darling I like you but no so fast]. The English may be funny at times but they do manage to get the point across! They also get philosophical and give you advice on how to live your life well. 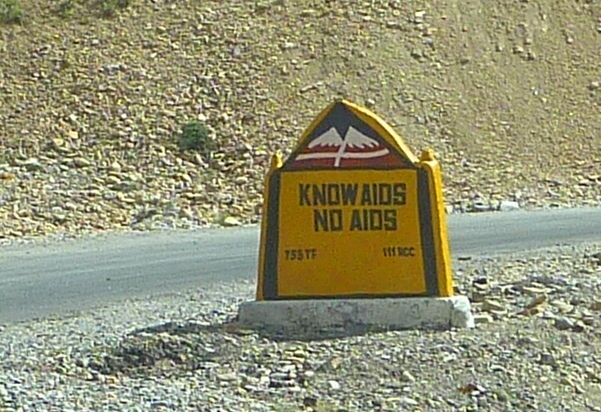 A lot of people don’t pay attention to things like road signs while they travel. They concentrate on the scenery, click a few photographs of the nature around them and zoom off to the next destination. That is what makes Ajay's book so different. He looks at travel from a vastly different angle and perspective, and manages to capture something most of us would have missed. This book is a must buy for all the quirky travellers out there ! (All images have been taken from the website Peep Peep Dont Sleep. 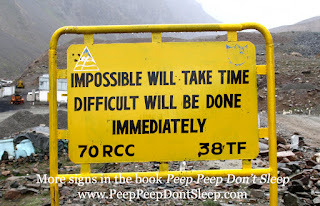 I love watching for sign boards and this is sort of my dream book. Would love to go through it. @Shail – Unusual is the word ! @Akanksha – so it is ! 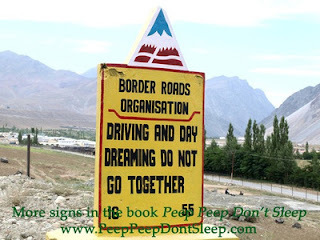 @Corinne – I love looking out for interesting sign boards as well ! This sounds so unusual....... Rum is bomb, and mind your brakes makes sense while driving, esp on a hilly terrain. His earlier books also created a buzz...haven't read them though. These traffic safety slogans are so interesting, and as you wrote, they are philosophical and can be life philosophy as well. Thanks for taking time to see “いつも何度でも”post. The English lyrics is not my translation but by Julie Rogers as is written at the top of the post. I wish I could have translation skills that way. I really like that translation based on the translator’s interpretation. Now that I know you are a translator, I understand why you have a way with words containing your heart. You are so lucky that you were not in Japan at the time of Tohoku Earthquake and tsunami. I’m sorry to keep you busy but if you feel inclined, please have a look at http://stardustenglishwriting.blogspot.jp/2011/04/soul-of-cherry-blossoms.html This is what I felt about Tohoku people at that time. I had always wanted to do the same.. click photos of all the funny BRO road signs that I see on the Himalayan roads. However, one really needs their own vehicle to do that (I was traveling in share-taxis). I did the next best thing - write them in my notes. Hi ! Your slogans are really incredible! I like that these slogans are actually things I can try to make. Love it!